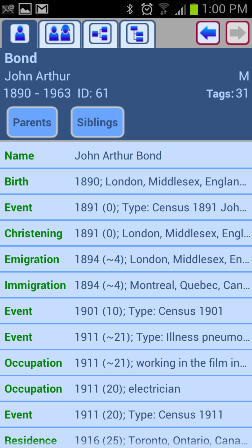 GedStar Pro is an app for your Android phone or tablet that lets you view your genealogy data in detail. The app is free to install from the Google Play store but it requires a companion Windows program to extract and convert the data that is stored in your genealogy program on your PC into the required format. 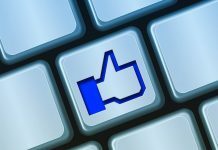 The Windows program has a 30 day trial and after the trial period, has a purchase price of $9.95. 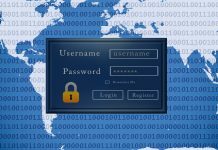 The Windows program creates a proprietary GedStar file from your data. 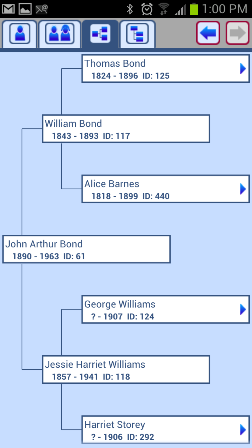 If you use either The Master Genealogist or Legacy Family Tree, you are able to convert your database directly. For all other genealogy programs, you must first export a GEDCOM file and use that to generate your GedStar file. First, I downloaded and installed the free GedStar app on my Android phone. I was able to view the sample data immediately. Next, I downloaded and installed the PC companion program from the GedStar website. My genealogy database is Roots Magic 5, so my first step was to export a GEDCOM file (file, export). Once I had exported the GEDCOM, I opened the GedStar Pro program on my PC. The GedStar program is a utility that allows you to convert your database or GEDCOM file into the GedStar file format required by the app. There are five tabs that allow customization of the import options. The Events tab allows you to choose which event types will be imported (default is all). 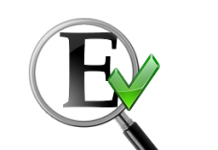 The Sources tab allows you to choose whether to import source citations, citation text, source detail text or repositories (default is all). The Options tab contains various settings including whether or not to import memos and notes (default is yes). The Photos tab has options to import photos (default is no). The Database tab is where you select your database or GEDCOM file to convert. Since I use Roots Magic 5 for my genealogy database on my PC, I began by exporting a GEDCOM file (File, export) of everyone in my database. From the GedStar program, I selected the GEDCOM and clicked “Convert Database”, keeping all the default settings on the other tabs. Since my database is quite large, it took several minutes to convert. Once it was done, I copied the new GedStar file to one of my Dropbox folders on my PC and waited for it to sync. On my phone, I opened Dropbox and located the GedStar file. I opened the file which took a few minutes to download. Once it was done, the GedStar application opened on my phone and my data was displayed. 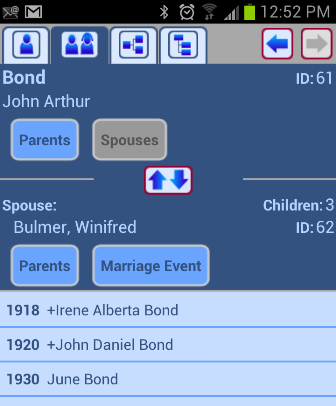 Pros – Having GedStar Pro on your Android phone and tablet lets you easily view your genealogy data when you’re on the go. Cons – The first time you create and upload a GedStar file to your device, the process seems to be a little complicated but the step by step instructions on the documentation page of the GedStar website walk you through it. At first, I thought that it would be great to be able to edit my family data from an Android app but the more I use GedStar, the more I realize that I’m happier doing my edits from my desktop, rather than from my phone. If, while viewing my data, I discover a piece of information that needs to be edited, I take a screenshot of the page showing the data in question and email it to myself along with my notes about the change.